We have Sleepboxes with one and two beds. You can also stay in our stylish suites for 2 or 3 persons. Our hotel has a free Wi-Fi and iPads for guests. Cupboards, tables, hooks for clothes, sockets, windows, blinds — all facilities of a classic room in nano format. 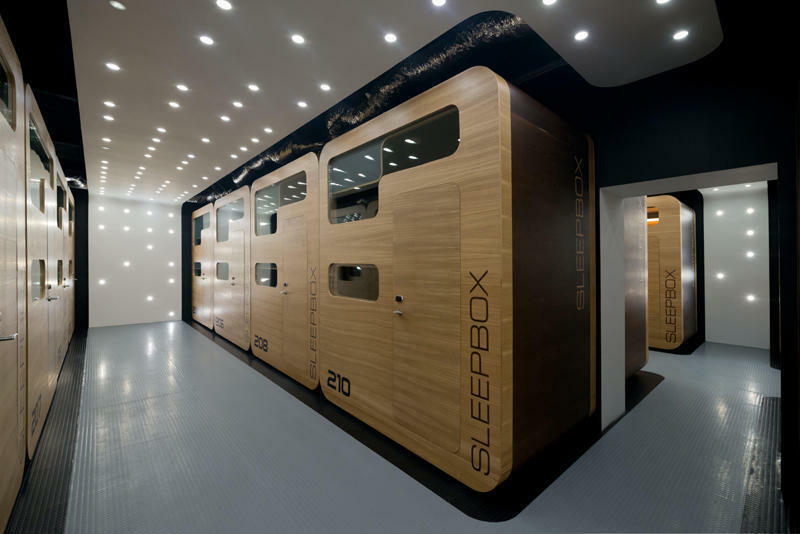 Sleepboxes have central air conditioning. Single Sleepbox has TV inside and wider bed. Fashionable individual bathrooms are on the floor. For every guest: free fast Wi-Fi, closets, access to hotel’s iPads, smoking room. Early check-in and late check-out are paid. The hotel and it's rooms are non-smoking, you can smoke in the smoking room. For children aged more than 6 years. We are located in 3 minutes to walk from Belorusskiy train station and metro station Belorusskaya, right on the street 1st Tverskaya-Yamskaya. The Kremlin and the Bolshoi Theatre are 10 minutes' metro ride from the hotel. It also takes 25 minnutes by foot to get to Red square. We are easy to reach from Sheremetievo airport - just 35 minnuted by aeroexpress and you are on Belorusskiy train station.